Happy boxing day all! Looks like more good news came during this holiday season in the form of more Kuroko no Basket! Jump NEXT’s Winter issue has announced that work on season 2 is under way. Now that we’re getting a season 2, I can let out a big sigh of relief. Unless you’ve been living under a rock (or don’t follow ANN on twitter), KuroBas‘ year has been littered with cancelled events due to threats. All because of one man, the series’ recognition has been tainted. I thought it was enough to stop Production I.G or any other studio from associating with the series. 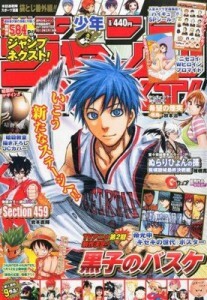 Were it not for one man’s crusade against Kuroko no Basket, this announcement would have been expected. The Blu-Ray and DVD sales make this series one of the best selling anime of 2012, and we haven’t even gotten to the manga. Recently volumes of Kuroko no Basket have been opening at around 350,000, compared to the 150-200,000 opening week sales it had before the anime. Not only did sales improve, but the series got out of the bottom of Shonen Jump’s table of contents where it was perpetually stuck. Now it’s getting colour pages and covers, when before it could only hope for so much. Then of course we had the help of our wonderful fujoshi. Never underestimate the popularity of bishonens playing basketball, or doing anything else for that matter. When your disqualification from Comiket looses the event over 10 million yen, you know you’re popular. Of course this cancellation was understandable given the current situation, so I won’t hold it against them. Looks like we’ll be seeing the Winter Cup arc in all of its animated glory! A good arc with plenty of climaxes and exciting matches. Also, there are the two members of the generation of miracles we have yet to meet. The word excitement has now reached a whole new meaning for me and now the hardest part is the wait. UPDATE (08/04/2013): ANN has just confirmed Kuroko no Basket‘s second season is set to air this September, for the Fall 2013 anime season. well that's great news. After reading the series of news regarding KuroBas bomb threats over at ANN, I honestly doubt back then that a 2nd season will be done. It made me doubtful for sure. Luckily sales weren't affected in a negative way. I can't wait this season.. I love this anime.. Anyone have any idea when it'll be released? Popular opinion is Spring – only because that's when season one aired. Could it be released soon??? My blood becomes boiled to see the next war between Kuroko and Kiseki no Sedai….!!! all the good anime's coming back! ahhh. shippuden (of course, daily), initial d, sekirei had its comeback, now all we need is freaking BLEACH ;~~~; -cries- also want Sword Art Online (sao) haha.. I can't wait for the next season!!!!. Any news yet on the release date? I’m so excited!!! Not yet, though they have released a key visual. Hopefully release date info will follow. I Love this Anime I Hope It will Released sooner!!! Can’t wait ^_^…!!! After watched this anime i felt lucking tsk3. . .I CANT WAIT TO THE NEXT SEASON where they making Tetsu's basketball and i cant wait to meet the captn of the Generation Miracles Akachin!! who discover the talent of tetsu damn is there any manga here to read the season 2? i expect this date will be release soon. im going to other country for work. It's Better i buy the 2 season of this series. i like almost the players have different talents. great job for this. A revise of SLAM DUNK. Fall 2013 is when it starts airing. i Can't Wait to see the next season i really wan't to know akashi's Move's this anime make's me Love Basket ball because i really don't like basket ball but when i see this anime i just say wow what a move my idol here is midorima shintarou now i'm playing basket ball 1 – 2 months now this anime is my inspiration Thanks . . . and when is the new season ?? OMG!!!!! I love this anime, so happy there’s a season 2, I really can’t wait. Yay! 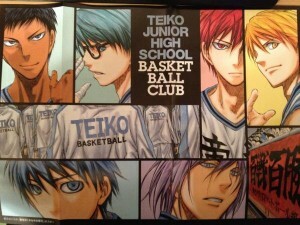 And after seeing the preview of the second series that was shown at Kurobas Cup 2013, I am even more and more excited!!! 😀 I love this series, both the manga and anime! Looks like we’ll be seeing the Winter Cup arc in all of its animated glory! A good arc with plenty of climaxes and exciting matches.